1.1 Parties: This Lease (Lease) dated September 25, 2000, is made by and between AMB Property, L.P., a Delaware limited partnership, (Landlord) and Capstone Turbine Corporation, a Delaware corporation, (Tenant) (collectively, the Parties or individually, a Party). o Approximately square feet of space as depicted on Exhibit A. 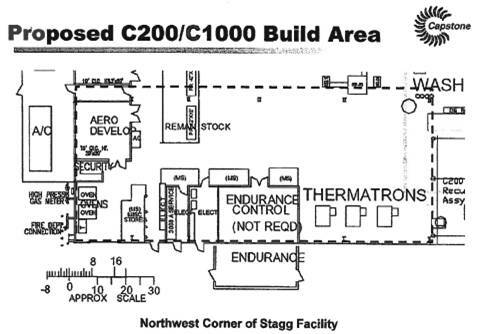 This space is a part of the building (Building) which is also identified on Exhibit A.
x All of the building (Building) identified on Exhibit A, consisting of approximately 78,711 square feet and commonly known as 16640 Stagg Street, Van Nuys, California. 1.3 Term: 10 years and 2 months (Term) commencing October 1, 2000 (Commencement Date) and ending December 31, 2010 (Expiration Date). 1.4 Base Rent: $44,078.00 per month (Base Rent). $51,495.00 is payable on execution of this Lease for the period December 2000. 1.7 Security Deposit: $44,078.00 (Security Deposit). 1.8 Permitted Use (Permitted Use): Office, assembly, product testing (outside and inside), warehouse and distribution of micro-turbines, recuperators and related parts and for other general office, assembly, warehouse and distribution purposes provided they do not involve Hazardous Substances, as defined in this Lease and for no other purpose. Exhibit A: Description of Premises. Exhibit B: Commencement Date Certificate. 2.1 Letting. Landlord hereby leases to Tenant and Tenant hereby leases from Landlord the Premises upon all of the terms, covenants, and conditions, set forth in this Lease. Any statement of square footage set forth in this Lease or that may have been used in calculating Base Rent and/or Operating Expenses is an approximation which Landlord and Tenant agree is reasonable, and the Base Rent and Tenants Share based thereon is not subject to revision whether or not the actual square footage is more or less. 2.2 Condition of Premises. Landlord shall deliver the Premises to Tenant clean and free of debris on the Commencement Date. Landlord represents and warrants to Tenant that the roof shall be water-tight and the plumbing, lighting, ceiling, interior and exterior walls, electrical, air conditioning, fire-sprinklers, heating, ventilating and other mechanical systems and equipment and fixtures in the Premises, and the loading doors shall be in good operating condition on the Commencement Date. Without limitation to Landlords obligations as set forth in Paragraph 7.2, in the event that Tenant gives notice to Landlord within 6 months following the Commencement Date of any defect or malfunction in or repair reasonably needed to any of the aforementioned items or systems, as long as not caused by Tenant, then it shall be the obligation of Landlord to promptly, at Landlords sole cost and expense, perform such work. 3.1 Term. The Commencement Date, Expiration Date, and Term of this Lease are as specified in Paragraph 1.3. 3.2 Delay in Possession. If for any reason Landlord cannot deliver possession of the Premises to Tenant by the Commencement Date, except as provided below, Landlord shall not be subject to any liability therefor, nor shall such failure affect the validity of this Lease or the obligations of Tenant hereunder. In such case, Tenant shall not, except as otherwise provided herein, be obligated to pay Rent or perform any other obligation of Tenant under the terms of this Lease until Landlord delivers possession of the Premises to Tenant. The term of the Lease shall commence on the earlier of (a) the date Tenant takes possession of the Premises or (b) 10 days following notice to Tenant that Landlord is prepared to tender possession of the Premises to Tenant. If possession of the Premises is not delivered to Tenant within 60 days after the Commencement Date and such delay is not due to Tenants acts, failure to act, or omissions, Tenant shall have the option to either (i) by notice in writing to Landlord within 10 days after the end of said 60-day period cancel this Lease and the parties shall be discharged from all obligations hereunder; or (ii) elect not to cancel this Lease, in which case Tenant shall receive rent abatement, to be applied to the rent coming due when the term of the Lease commences, equal to one day for each day following such sixtieth (60th) day that Landlord fails to deliver the Premises to Tenant If such written notice of Tenants cancellation under (i) above is not received by Landlord within said 10-day period, Tenants right to cancel this Lease shall terminate and Tenant shall be deemed to have elected option (ii) above. 3.3 Commencement Date Certificate. At the request of Landlord, Tenant shall execute and deliver to Landlord a completed certificate (Commencement Date Certificate) in the form attached hereto as Exhibit B. 4.1 Base Rent. Tenant shall pay to Landlord Base Rent and other monetary obligations of Tenant to Landlord under the terms of this Lease (such other monetary obligations are herein referred to as Additional Rent) in lawful money of the United States, without offset or deduction, in advance on or before the first day of each month. Base Rent and Additional Rent for any period during the term hereof which is for less than one full month shall be prorated based upon the actual number of days of the month involved. Payment of Base Rent and Additional Rent shall be made to Landlord at its address stated herein or to such other persons or at such other addresses as Landlord may from time to time designate in writing to Tenant. Base Rent and Additional Rent are collectively referred to as Rent. All monetary obligations of Tenant to Landlord under the terms of this Lease are deemed to be Rent. (i) The operation, repair, maintenance, and replacement in neat, clean, good order, and condition of the areas of the Premises Landlord is obligated to maintain under this Lease. 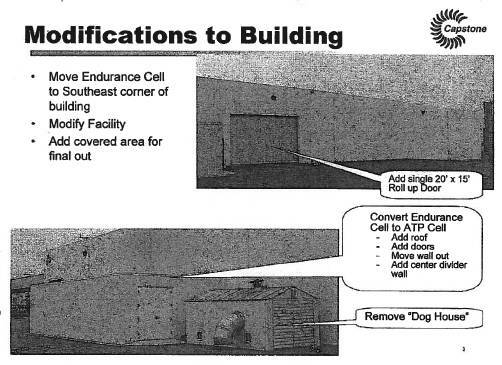 (iii) Reserves set aside for maintenance, repair, and replacement of the Building. (v) Premiums for the insurance policies maintained by Landlord under Paragraph 8 hereof. (vi) Environmental monitoring and insurance programs, but only in the event that such monitoring is required by the acts or omissions of Tenant or its agents. (vii) Monthly amortization of capital improvements to the Building. The monthly amortization of any given capital improvement shall be the sum of the (a) quotient obtained by dividing the cost of the capital improvement by Landlords estimate of the number of months of useful life of such improvement plus (b) an amount equal to the cost of the capital improvement times 1/12 of the lesser of 12% or the maximum annual interest rate permitted by law. (viii) Maintenance of the Building including, but not limited to, painting, caulking, and repair and replacement of Building components, including, but not limited to, roof, elevators, and fire detection and sprinkler systems. (ix) Maintenance, repair and replacement of the heating, ventilating, and air conditioning systems (HVAC). (b) Tenants Share of Operating Expenses shall be 100%. (c) Tenant shall pay monthly in advance, on the same day that the Base Rent is due, Tenants Share of estimated Operating Expenses and HVAC maintenance costs in the amount set forth in Paragraph 1.6. Landlord shall deliver to Tenant within 90 days after the expiration of each calendar year a reasonably detailed statement showing Tenants Share of the actual Operating Expenses incurred during the preceding year. If Tenants estimated payments under this Paragraph 4(c) during the preceding year exceed Tenants Share as indicated on said statement, Tenant shall be credited the amount of such overpayment against Tenants Share of Operating Expenses next becoming due, or, if such amount is owing at the end of Lease term, such amount shall be paid within 30 days following the end of the Lease term. If Tenants estimated payments under this Paragraph 4.2(c) during said preceding year were less than Tenants Share as indicated on said statement, Tenant shall pay to Landlord the amount of the deficiency within 30 days after delivery by Landlord to Tenant of said statement. At any time Landlord may, in the exercise of its reasonable judgment, adjust the amount of the estimated Tenants Share of Operating Expenses and HVAC maintenance costs to reflect Landlords estimate of such expenses for the year. 5. SECURITY DEPOSIT. Tenant shall deposit with Landlord upon Tenants execution hereof the Security Deposit set forth in Paragraph 1.7 as security for Tenants faithful performance of Tenants obligations under this Lease. If Tenant fails to pay Base Rent or Additional Rent or otherwise defaults under this Lease (as defined in paragraph 13.1), landlord may use the security deposit for the payment of any amount due Landlord or to reimburse or compensate Landlord for any liability, cost, expense, loss, or damage (including attorneys fees) which Landlord may suffer or incur by reason thereof. Tenant shall on demand pay Landlord the amount so used or applied so as to restore the Security Deposit to the amount set forth in Paragraph 1.7. Landlord shall not be required to keep all or any part of the Security Deposit separate from its general accounts. Landlord shall, at the expiration or earlier termination of the term hereof and after Tenant has vacated the Premises, return to Tenant that portion of the Security Deposit not used or applied by Landlord. No part of the Security Deposit shall be considered to be held in trust, to bear interest, or to be prepayment for any monies to be paid by Tenant under this Lease. contrary to any law or ordinance, or which will invalidate or increase the premiums for any of Landlords insurance. Tenant shall not service, maintain, or repair vehicles on the Premises. Tenant shall not store foods, pallets, drums, or any other materials outside the Premises. Notwithstanding the foregoing, Tenant shall be permitted, provided such use is not in violation of any law or ordinance and such use is screened from view by screening reasonably acceptable to Landlord, to use the exterior areas of the Premises for the purposes of product testing and uses related to such product testing. (a) Reportable Uses Require Consent. The term, Hazardous Substance, as used in this Lease, shall mean any product, substance, chemical, material, or waste whose presence, nature, quantity, and/or intensity of existence, use, manufacture, disposal, transportation, spill, release, or effect, either by itself or in combination with other materials expected to be on the Premises, is either: (i) potentially injurious to the public health, safety or welfare, the environment, or the Premises; (ii) regulated or monitored by any governmental authority; or (iii) a basis for potential liability of Landlord to any governmental agency or third party under any applicable statute or common law theory. Hazardous Substance shall include, but not be limited to, hydrocarbons, petroleum, gasoline, crude oil, or any products or by-products thereof. Tenant shall not engage in any activity in or about the Premises which constitutes a Reportable Use (as hereinafter defined) of Hazardous Substances without the express prior written consent of Landlord and compliance in a timely manner (at Tenants sole cost and expense) with all Applicable Requirements (as defined in Paragraph 6.3). Reportable Use shall mean (i) the installation or use of any above or below ground storage tank, (ii) the generation, possession, storage, use, transportation, or disposal of a Hazardous Substance that requires a permit from, or with respect to which a report, notice, registration, or business plan is required to be filed with, any governmental authority, and (iii) the presence in, on, or about the Premises of a Hazardous Substance with respect to which any Applicable Requirements require that a notice be given to persons entering or occupying the Premises or neighboring properties. Notwithstanding the foregoing, Tenant may, without Landlords prior consent, but upon notice to Landlord and in compliance with all Applicable Requirements, use any ordinary and customary materials reasonably required to be used by Tenant in the normal course of the Permitted Use, so long as such use is not a Reportable Use and does not expose the Premises or neighboring properties to any meaningful risk of contamination or damage, or expose Landlord to any liability therefor. In addition, Landlord may (but without any obligation to do so) condition its consent to any Reportable Use of any Hazardous Substance by Tenant upon Tenants giving Landlord such additional assurances as Landlord, in its reasonable discretion, deems necessary to protect itself, the public, the Premises, and the environment against damage, contamination, injury, and/or liability therefor, including but not limited to the installation (and, at Landlords option, removal on or before Lease expiration or earlier termination) of reasonably necessary protective modifications to the Premises (such as concrete encasements) and/or the deposit of an additional Security Deposit. (b) Duty to Inform Landlord. If Tenant knows, or has reasonable cause to believe, that a Hazardous Substance is located in, under, or about the Premises or the Building, Tenant shall immediately give Landlord written notice thereof, together with a copy of any statement, report, notice, registration, application, permit, business plan, license, claim, action, or proceeding given to, or received from, any governmental authority or private party concerning the presence, spill, release, discharge of, or exposure to such Hazardous Substance. Tenant shall not cause or permit any Hazardous Substance to be spilled or released in, on, under, or about the Premises (including, without limitation, through the plumbing or sanitary sewer system). restoration and/or abatement thereof, or of any contamination therein involved. Tenants obligations under this Paragraph 6.2(c) shall survive the Expiration Date or earlier termination of this Lease. 6.3 Tenants Compliance with Requirements. Tenant shall, at Tenants sole cost and expense, fully, diligently, and in a timely manner comply with all Applicable Requirements, which term is used in this Lease to mean all laws, rules, regulations, ordinances, directives, covenants, easements, and restrictions of record, permits, the requirements of any applicable fire insurance underwriter or rating bureau, and the reasonable recommendations of Landlords engineers and/or consultants, relating in any manner to the Premises (including but not limited to matters pertaining to (a) industrial hygiene, (b) environmental conditions on, in, under, or about the Premises, including soil and groundwater conditions, and (c) the use, generation, manufacture, production, installation, maintenance, removal, transportation, storage, spill, or release of any Hazardous Substance), now in effect or which may hereafter come into effect. Tenant shall, within 5 days after receipt of Landlords written request, provide Landlord with copies of all documents and information evidencing Tenants compliance with any Applicable Requirements, and shall immediately upon receipt notify Landlord in writing (with copies of any documents involved) of any claim, notice, citation, warning, complaint, or report pertaining to or involving failure by Tenant or the Premises to comply with any Applicable Requirements. 6.4 Inspection; Compliance with Law. In addition to Landlords environmental monitoring and insurance program, the cost of which is included in Operating Expenses as provided in Paragraph 4, Landlord and the holders of any mortgages, deeds of trust, or ground leases on the Premises (Lenders) shall have the right to enter the Premises at any time in the case of an emergency, and otherwise at reasonable times, for the purpose of inspecting the condition of the Premises and for verifying compliance by Tenant with this Lease and all Applicable Requirements. Landlord shall be entitled to employ experts and/or consultants in connection therewith to advise Landlord with respect to Tenants installation, operation, use, monitoring, maintenance, or removal of any Hazardous Substance on or from the Premises. The cost and expenses of any such inspections shall be paid by the party requesting same unless a violation of Applicable Requirements exists or is imminent, or the inspection is requested or ordered by a governmental authority. Tenant shall upon request reimburse Landlord or Landlords Lender, as the case may be, for the costs and expenses of such inspections. 7.1 Tenants Obligations. Subject to the provisions of Paragraph 2.6 (Condition of the Premises, Paragraph 7.2 (Landlords Obligations), Paragraph 9 (Damage or Destruction), and Paragraph 14 (Condemnation), Tenant shall, at Tenants sole cost and expense and at all times, keep the Premises and every part thereof in good order, condition, and repair (whether or not such portion of the Premises requiring repair, or the means of repairing the same, are reasonable or readily accessible to Tenant and whether or not the need for such repairs occurs as a result of Tenants use, any prior use, the elements, or the age of such portion of the Premises) including, without limiting the generality of the foregoing, all equipment or facilities specifically serving the Premises, such as plumbing, heating, ventilating, electrical, lighting facilities, boilers, fired or unfired pressure vessels, fire hose connectors if within the Premises, fixtures, interior walls, interior surfaces of exterior walls, ceilings, floors, windows, doors, plate glass, and skylights, but excluding any items which are the responsibility of Landlord pursuant to Paragraph 7.2 below. Tenants obligations shall include restorations, replacements, or renewals when necessary to keep the Premises and all improvements thereon or a part thereof in good order, condition, and state of repair. 7.2 Landlords Obligations. 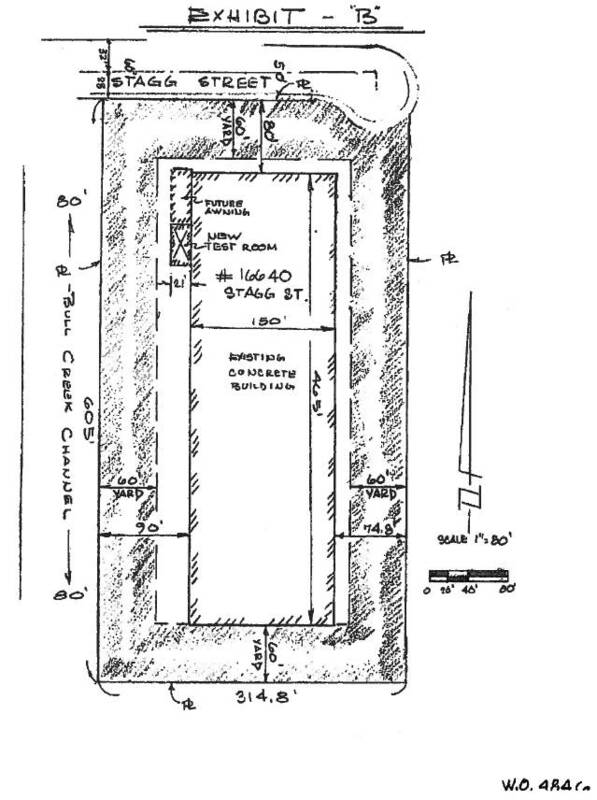 Subject to the provisions of Paragraph 6 (Use), Paragraph 7.1 (Tenants Obligations), Paragraph 9 (Damage or Destruction), and Paragraph 14 (Condemnation), Landlord, at its expense and not subject to the reimbursement requirements of Paragraph 4.2, shall keep in good order, condition, and repair the roof structure, foundations and exterior walls of the Building. Landlord, subject to reimbursement pursuant to Paragraph 4.2, shall keep in good order, condition, and repair the air conditioning systems servicing the Premises, Building roof membrane, and Common Areas. 7.3 Alterations. Tenant shall not make nor cause to be made any alterations or installations in, on, under, or about the Premises without the prior written consent of Landlord which will not be unreasonably withheld or delayed. the generality of the above, Tenant shall remove all Alterations designated by Landlord in Landlords sole discretion, personal property, trade fixtures, and floor bolts, patch all floors, and cause all lights to be in good operating condition. Notwithstanding the foregoing, Tenant by written notice to Landlord may require, prior to the installation of any Alterations, that Landlord elect whether such Alterations must be removed at the end of the Lease term or whether Tenant shall have the option of removing such Alterations at the end of the Lease term, and Landlord shall make such election within 20 days following Landlords receipt such written notice. 8.1 Payment of Premiums. The cost of the premiums for the insurance policies maintained by Landlord under this Paragraph 8 shall be an Operating Expense reimbursable pursuant to Paragraph 4.2 hereof. Premiums for policy periods commencing prior to, or extending beyond, the term of this Lease shall be prorated to coincide with the corresponding Commencement Date and Expiration Date. (a) At its sole cost and expense, Tenant shall maintain in full force and effect during the Term of the Lease the following insurance coverages insuring against claims which may arise from or in connection with the Tenants operation and use of the Premises. (i) Commercial General Liability insurance with minimum limits of $1,000,000 per occurrence and $3,000,000 general aggregate for bodily injury, personal injury, and property damage. If required by Landlord, liquor liability coverage will be included. Such insurance shall be endorsed to include Landlord and Landlord Entities as additional insureds, shall be primary and noncontributory with any Landlord insurance, and shall provide severability of interests between or among insureds. (ii) Workers Compensation insurance with statutory limits and Employers Liability with a $1,000,000 per accident limit for bodily injury or disease. (iii) Automobile Liability insurance covering all owned, nonowned, and hired vehicles with a $1,000,000 per accident limit for bodily injury and property damage. (b) Tenant shall deliver to AMB certificates of all insurance reflecting evidence of required coverages prior to initial occupancy, and annually thereafter. (c) If, in the opinion of Landlords insurance advisor, the amount or scope of such coverage is deemed inadequate at any time during the Term, Tenant shall increase such coverage to such reasonable amounts or scope as Landlords advisor deems adequate and which are customary for premises of the size and location of the Premises. (d) All insurance required under Paragraph 8.2 (i) shall be issued by insurers licensed to do business in the state in which the Premises are located and which are rated A:VII or better by Bests Key Rating Guide and (ii) shall be endorsed to provide at least 30-days prior notification of cancellation or material change in coverage to said additional insureds. 8.3 Landlords Insurance. Landlord shall maintain all risks coverage as broad as the current ISO Special Form policy, including earthquake and flood, covering Building and such other insurance in such amounts and covering such other liability or hazards as deemed appropriate by Landlord. The amount and scope of coverage of Landlords insurance shall be determined by Landlord from time to time in its sole discretion and shall be subject to such reasonable deductible amounts as Landlord may elect. Except as to the all risks coverage for the Building, Landlord shall have the right to reduce or terminate any insurance or coverage. 8.4 Waiver of Subrogation. To the extent permitted by law and with permission of their insurance carriers, Landlord and Tenant each waive any right to recover against the other on account of any and all claims Landlord or Tenant may have against the other with respect to property insurance actually carried, or required to be carried hereunder, to the extent of the proceeds realized from such insurance coverage. (d) any breach or default on the part of Tenant in the performance of any covenant or agreement to be performed pursuant to this Lease. The provisions of this Paragraph 8.5 shall, with respect to any claims or liability accruing prior to such termination, survive the Expiration Date or earlier termination of this Lease. 8.6 Exemption of Landlord from Liability. Except to the extent caused by the gross negligence or willful misconduct of Landlord, Landlord shall not be liable for and Tenant waives any claims against Landlord for injury or damage to the person or the property of Tenant, Tenant Entities, or any other person in or about the Premises, Building, or Industrial Center from any cause whatsoever, including, but not limited to, damage or injury which is caused by or results from (a) fire, steam, electricity, gas, water, or rain, or from the breakage, leakage, seepage, back up of sewers or drains, obstruction, or other defects of pipes, fire sprinklers, wires, appliances, plumbing, air conditioning, or lighting fixtures or (b) from the condition of the Premises, other portions of the Building, or Industrial Center. Landlord shall not be liable for any damages arising from any act or neglect of any other tenant of Landlord nor from the failure by Landlord to enforce the provisions of any other lease of which Landlord is the landlord. Except with respect to Landlords gross negligence or willful misconduct, Landlord shall not be liable for injury to Tenants business, for any loss of income or profit therefrom, or any indirect, consequential, or punitive damages. 9.1 Termination Right. Tenant shall give Landlord immediate written notice of any damage to the Premises. Subject to the provisions of Paragraph 9.2, if the Premises or the Building shall be damaged to such an extent that there is substantial interference for a period exceeding 90 consecutive days with the conduct by Tenant of its business at the Premises, Tenant, at any time prior to commencement of repair of the Premises and following 10 days written notice to Landlord, may terminate this Lease effective 30 days after delivery of such notice to Landlord. Such termination shall not excuse the performance by Tenant of those covenants which under the terms hereof survive termination. Rent shall be abated in proportion to the degree of interference during the period that there is such substantial interference with the conduct of Tenants business at the Premises. Abatement of rent and Tenants right of termination pursuant to this provision shall be Tenants sole remedy for Tenants loss of beneficial use of the Premises due to the failure of Landlord to keep in good order, condition, and repair the foundations and exterior walls of the Building, Building roof, utility systems outside the Building, the Common Areas, and HVAC. 9.2 Damage Caused by Tenant. Tenants termination rights under Paragraph 9.1 shall not apply if the damage to the Premises or Building is the result of any act or omission of Tenant or of any of Tenants, agents, employees, customers, invitees, or contractors (Tenant Acts). Any damage resulting from a Tenant Act shall be promptly repaired by Tenant. Landlord at its option may at tenants expense repair any damage caused by tenant acts. Tenant shall continue to pay all rent and other sums due hereunder and shall be liable to Landlord for all damages that Landlord may sustain resulting from a Tenant Act. This section shall not apply to any damage covered by Landlords insurance pursuant to Section 8.3. 10.1 Payment of Real Property Taxes. Landlord shall pay the Real Property Taxes due and payable during the term of this Lease and, except as otherwise provided in Paragraph 10.3, such payments shall be a Common Area Operating Expense reimbursable pursuant to Paragraph 4.2. Notwithstanding the foregoing, there shall be excluded from Real Property Taxes: (i) all excess profits taxes, franchise taxes, gift taxes, capital stock taxes, inheritance and succession taxes, estate taxes, federal and state income taxes, and other taxes to the extent applicable to Landlords general or net income (as opposed to rents, receipts, or income attributable to operations at the project), and (ii) any items included as operating expenses. Building, (c) Landlords right to rent or other income from the Industrial Center or Building, and/or (d) Landlords business of leasing the Premises. Real Property Taxes include (a) any licenses fee, commercial rental tax, excise tax, improvement bond or bonds, levy, or tax; (b) any tax or charge which replaces or is in addition to any of such above-described Real Property Taxes, and (c) any fees, expenses, or costs (including attorneys fees, expert fees, and the like) incurred by Landlord in protesting or contesting any assessments levied or any tax rate. Real Property Taxes for tax years commencing prior to, or extending beyond, the term of this Lease shall be prorated to coincide with the corresponding Commencement Date and Expiration Date. 10.3 Additional Improvements. Operating Expenses shall not include Real Property Taxes attributable to improvements placed upon the Building by Landlord unless requested by Tenant. Tenant shall, however, pay to Landlord at the time Operating Expenses are payable under Paragraph 4.2, the entirety of any increase in Real Property Taxes if assessed by reason of improvements placed upon the Premises by Tenant or at Tenants request. 10.4 Joint Assessment. If the Building is not separately assessed, Real Property Taxes allocated to the Building shall be an equitable proportion of the Real Property Taxes for all of the land and improvements included within the tax parcel assessed. 10.5 Tenants Property Taxes. Tenant shall pay prior to delinquency all taxes assessed against and levied upon Tenants improvements, fixtures, furnishings, equipment, and all personal property of Tenant contained in the Premises. 11. UTILITIES. Tenant shall pay directly for all utilities and services supplied to the Premises, including but not limited to electricity, telephone, security, gas, and cleaning of the Premises, together with any taxes thereon. (a) Tenant shall not assign, transfer, mortgage, or otherwise transfer or encumber (collectively, assign) or sublet all or any part of Tenants interest in this Lease or in the Premises without Landlords prior written consent, which consent shall not be unreasonably withheld. Relevant criteria in determining reasonability of consent include, but are not limited to, credit history of a proposed assignee or sublessee, references from prior landlords, any change or intensification of use of the Premises or the Common Areas, and any limitations imposed by the Internal Revenue Code and the Regulations promulgated thereunder relating to Real Estate Investment Trusts. Assignment or sublet shall not release Tenant from its obligations hereunder. Tenant shall not (i) sublet, assign, or enter into other arrangements in which the amounts to be paid by the sublessee or assignee thereunder would be based, in whole or in part, on the income or profits derived by the business activities of the sublessee or assignee; (ii) sublet the Premises or assign this Lease to any person or entity in which Landlord owns an interest, directly or indirectly (by applying constructive ownership rules set forth in Section 856(d)(5) of the Internal Revenue Code (the Code); or (iii) sublet the Premises or assign this Lease in any other manner which could cause any portion of the amounts received by Landlord pursuant to this Lease or any sublease to fail to qualify as rents from real property within the meaning of Section 856(d) of the Code, or which could cause any other income received by Landlord to fail to qualify as income described in Section 856(c)(2) of the Code. The requirements of this Section 12.1 shall apply to any further subleasing by any subtenant. Notwithstanding the foregoing, in the event of any assignment or subletting to which Landlord consents, Landlord shall receive fifty percent (50%), in the event of a sublease, of any rent received by Tenant above the rent then being paid by Tenant to Landlord less: (i) rent obligations paid by Tenant hereunder during any period when the Premises were vacant following the marketing of the Premises for such sublease; (ii) the costs of any tenant improvements made or allowance given to the subtenant for tenant improvements; (iii) any free rent or other economic concessions given the subtenant; and (iv) any commissions or marketing expense paid by Tenant for such sublease. In addition, Landlord shall receive fifty percent (50%), in the event of an assignment, of any profit derived by Tenant from such assignment less any commissions or marketing expense paid by Tenant for such assignment. In the event of any assignment or subletting, Tenant shall pay to Landlord or its authorized managing agent (as directed by Landlord)a fee of $750.00 to cover Landlords costs of review, negotiation, preparation or execution of any documentation regarding such assignment or subletting. Notwithstanding the foregoing, Tenant may sublease up to 50% of the Premises, pursuant to this Section, and Landlord shall not receive any portion of the profit derived from such sublease. Landlord shall approve or disapprove a proposed sublease of up to 50% of the Premises within ten (10) days following receipt of Tenants written request. (b) A change in the control of Tenant shall constitute an assignment requiring Landlords consent. The transfer, on a cumulative basis, of 25% or more of the voting or management control of Tenant shall constitute a change in control for this purpose, provided that changes resulting from the sale of stock through a recognized stock exchange shall not constitute a change of control hereunder. 12.2 Non-Transfers. The term Affiliate shall mean any entity which is controlled by controls, or is under common control with, Tenant or which merges with, is acquired by, or acquires all of Tenants assets or stock. Control, as used in this Paragraph 12.2, shall mean the possession, direct or indirect, of the power to direct or cause the direction of the management and policies of a person or entity, whether through the ownership of voting securities, by contract or otherwise. Notwithstanding anything to the contrary contained in this Paragraph 12, an assignment or subletting of all or a portion of the Premises to an Affiliate of Tenant shall not be deemed a Transfer under this Paragraph 12, provided that Tenant notifies Landlord of any such assignment or sublease and promptly supplies Landlord with any documents or information reasonably required by Landlord regarding such assignment or sublease or such Affiliate, and further provided that such assignment or sublease is not a subterfuge by Tenant to avoid its obligations and Tenant remains liable under this Lease. (6) at Landlords election, such other amounts in addition to or in lieu of the foregoing as may be permitted from time to time by applicable law. As used in subparagraphs (1) and (2) above, the worth at the time of award is computed by allowing interest at an annual rate equal to twelve percent (12%) per annum or the maximum rate permitted by law, whichever is less. As used in subparagraph (3) above, the worth at the time of award is computed by discounting such amount at the discount rate of the Federal Reserve Bank of San Francisco at the time of award, plus one percent (1 %). Tenant waives redemption or relief from forfeiture under California Code of Civil Procedure Sections 1174 and 1179, or under any other present or future law, in the event Tenant is evicted or Landlord takes possession of the Premises by reason of any Default of Tenant hereunder. (b) Continuation of Lease. In the event of any Default by Tenant, then in addition to any other remedies available to Landlord at law or in equity and under this Lease, Landlord shall have the remedy described in California Civil Code Section 1951.4 (Landlord may continue this Lease in effect after Tenants Default and abandonment and recover Rent as it becomes due, provided tenant has the right to sublet or assign, subject only to reasonable limitations). (c) Re-entry. In the event of any Default by Tenant, Landlord shall also have the right, with or without terminating this Lease, in compliance with applicable law, to re-enter the Premises and remove all persons and property from the Premises; such property may be removed and stored in a public warehouse or elsewhere at the cost of and for the account of Tenant. (d) Reletting. In the event of the abandonment of the Premises by Tenant or in the event that Landlord shall elect to re-enter or shall take possession of the Premises pursuant to legal proceeding or pursuant to any notice provided by law, then if Landlord does not elect to terminate this Lease as provided in Paragraph a, Landlord may from time to time, without terminating this Lease, relet the Premises or any part thereof for such term or terms and at such rental or rentals and upon such other terms and conditions as Landlord in its sole discretion may deem advisable with the right to make alterations and repairs to the Premises. In the event that Landlord shall elect to so relet, then rentals received by Landlord from such reletting shall be applied in the following order: (1) to reasonable attorneys fees incurred by Landlord as a result of a Default and costs in the event suit is filed by Landlord to enforce such remedies; (2) to the payment of any indebtedness other than Rent due hereunder from Tenant to Landlord; (3) to the payment of any costs of such reletting; (4) to the payment of the costs of any alterations and repairs to the Premises; (5) to the payment of Rent due and unpaid hereunder; and (6) the residue, if any, shall be held by landlord and applied in payment of future Rent and other sums payable by Tenant hereunder as the same may become due and payable hereunder. Should that portion of such rentals received from such reletting during any month, which is applied to the payment of Rent hereunder, be less than the Rent payable during the month by Tenant hereunder, then Tenant shall pay such deficiency to Landlord. Such deficiency shall be calculated and paid monthly. Tenant shall also pay to Landlord, as soon as ascertained, any costs and expenses incurred by Landlord in such reletting or in making such alterations and repairs not covered by the rentals received from such reletting. (e) Termination. No re-entry or taking of possession of the Premises by Landlord pursuant to this Addendum shall be construed as an election to terminate this Lease unless a written notice of such intention is given to Tenant or unless the termination thereof is decreed by a court of competent jurisdiction. Notwithstanding any reletting without termination by Landlord because of any Default by Tenant, Landlord may at any time after such reletting elect to terminate this Lease for any such Default. (f) Cumulative Remedies. The remedies herein provided are not exclusive and Landlord shall have any and all other remedies provided herein or by law or in equity. such merger take place, but shall operate as an assignment to Landlord of any and all, existing subleases, or Landlord may, at its option, elect in writing to treat such surrender as a merger terminating Tenants estate under this Lease, and thereupon Landlord may terminate any or all such subleases by notifying the sublessee of its election so to do within five (5) days after such surrender. (h) Notice Provisions. Tenant agrees that any notice given by Landlord pursuant to Paragraph 13.1 of the Lease shall satisfy the requirements for notice under California Code of Civil Procedure Section 1161, and Landlord shall not be required to give any additional notice in order to be entitled to commence an unlawful detainer proceeding. Should Landlord prepare any notice to Tenant for failure to pay rent, additional rent or perform any other obligation under the Lease, Tenant shall pay to Landlord, without any further notice from Landlord, the additional sum of $75.00 which the parties hereby agree represents a fair and reasonable estimate of the costs Landlord will incur by reason of preparing such notice. 13.3 Late Charges. Tenant hereby acknowledges that late payment by Tenant to Landlord of Rent and other sums due hereunder will cause Landlord to incur costs not contemplated by this Lease, the exact amount of which will be extremely difficult to ascertain. Such costs include, but are not limited to, processing and accounting charges. Accordingly, if any installment of Rent or other sum due from Tenant shall not be received by Landlord or Landlords designee within 4 days after such amount shall be due, then, without any requirement for notice to Tenant, Tenant shall pay to Landlord a late charge equal to 5% of such overdue amount. The parties hereby agree that such late charge represents a fair and reasonable estimate of the costs Landlord will incur by reason of late payment by Tenant. Acceptance of such late charge by Landlord shall in no event constitute a waiver of Tenants Default with respect to such overdue amount, nor prevent Landlord from exercising any of the other rights and remedies granted hereunder. In addition, should Landlord be unable to negotiate any payment made by Tenant on the first attempt by Landlord and without any notice to Tenant, Tenant shall pay to Landlord a fee of $50.00 per item which the parties hereby agree represents a fair and reasonable estimate of the costs Landlord will incur by reason of Landlords inability to negotiate such item(s). Notwithstanding the foregoing or anything to the contrary, Tenant shall not be obligated to pay a late charge until each time after the fourth time during the term or extended term of that Tenant fails to pay any amount due under this Lease within 4 days after said amount shall be due. 14. CONDEMNATION. If the Premises or any portion thereof are taken under the power of eminent domain or sold under the threat of exercise of said power (all of which are herein called condemnation), this Lease shall terminate as to the part so taken as of the date the condemning authority takes title or possession, whichever first occurs. If more than 10% of the floor area of the Premises, or more than 25% of the portion of the Common Areas designated for Tenants, parking, is taken by condemnation, Tenant may, at Tenants option, to be exercised in writing within 10 days after Landlord shall have given Tenant written notice of such taking (or in the absence of such notice, within 10 days after the condemning authority shall have taken possession), terminate this Lease as of the date the condemning authority takes such possession. If Tenant does not terminate this Lease in accordance with the foregoing, this Lease shall remain in full force and effect as to the portion of the Premises remaining, except that the Base Rent shall be reduced in the same proportion as the rentable floor area of the Premises taken bears to the total rentable floor area of the premises. No reduction of Base Rent shall occur if the condemnation does not apply to any portion of the Premises. Any award for the taking of all or any part of the Premises under the power of eminent domain or any payment made under threat of the exercise of such power shall be the property of Landlord; provided, however, that Tenant shall be entitled to any compensation, separately awarded to Tenant, for Tenants relocation expenses and/or loss of Tenants trade fixtures. In the event that this Lease is not terminated by reason of such condemnation, Landlord shall to the extent of its net severance damages in the condemnation matter, repair any damage to the Premises caused by such condemnation authority. Tenant shall be responsible for the payment of any amount in excess of such net severance damages required to complete such repair. estoppel certificate or, at Landlords option, Tenant shall pay a fee of $100.00 per day (Estoppel Delay Fee) for each day after the 10 days written notice in which Tenant fails to comply with this requirement. 15.2 Financial Statement. If Landlord desires to finance, refinance, or sell the Building, Industrial Center, or any part thereof, Tenant shall deliver to any potential lender or purchaser designated by Landlord such financial statements of Tenant as may be reasonably required by such lender or purchaser, including but not limited to Tenants financial statements for the past 3 years. All such financial statements shall be received by Landlord and such lender or purchaser in confidence and shall be used only for the purposes herein set forth. 16.1 Severability. The invalidity of any provision of this Lease, as determined by a court of competent jurisdiction, shall not affect the validity of any other provision hereof. 16.2 Interest on Past-Due Obligations. Any monetary payment due Landlord hereunder not received by Landlord within 10 days following the date on which it was due shall bear interest from the date due at 12% per annum, but not exceeding the maximum rate allowed by law in addition to the late charge provided for in Paragraph 13.3. 16.3 Time of Essence. Time is of the essence with respect to the performance of all obligations to be performed or observed by the Parties under this Lease. 16.4 Landlord Liability. Tenant, its successors, and assigns shall not assert nor seek to enforce any claim for breach of this Lease against any of Landlords assets other than Landlords interest in the Industrial Center. Tenant agrees to look solely to such interest for the satisfaction of any liability or claim against Landlord under this Lease. In no event whatsoever shall Landlord (which term shall include, without limitation, any general or limited partner, trustees, beneficiaries, officers, directors, or stockholders of Landlord) ever be personally liable for any such liability. 16.5 No Prior or Other Agreements. This Lease contains all agreements between the Parties with respect to any matter mentioned herein, and supersedes all prior or contemporaneous oral or written agreements or understandings. 16.6 Notice Requirements. All notices required or permitted by this Lease shall be in writing and may be delivered in person (by hand, messenger, or courier service) or may be sent by regular, certified, or registered mail or U.S. Postal Service Express Mail, with postage prepaid, or by facsimile transmission during normal business hours, and shall be deemed sufficiently given if served in a manner specified in this Paragraph 16.6. The addresses noted adjacent to a Partys signature on this Lease shall be that Partys address for delivery or mailing of notice purposes. Either Party may by written notice to the other specify a different address for notice purposes, except that upon Tenants taking possessing of the Premises, the Premises shall constitute Tenants address for the purpose of mailing or delivering notices to Tenant. A copy of all notices required or permitted to be given to Landlord hereunder shall be concurrently transmitted to such party or parties at such addresses as Landlord may from time to time hereafter designate by written notice to Tenant. 16.7 Date of Notice. Any notice sent by registered or certified mail, return receipt requested, shall be deemed given on the date of delivery shown on the receipt card, or if no delivery date is shown, the postmark thereon. If sent by regular mail, the notice shall be deemed given 48 hours after the same is addressed as required herein and mailed with postage prepaid. Notices delivered by United States Express Mail or an overnight courier that guarantees next day delivery shall be deemed given 24 hours after delivery of the same to the United States Postal Service or courier. If any notice is transmitted by facsimile transmission or similar means, the same shall be deemed served or delivered upon telephone or facsimile confirmation of receipt of the transmission thereof, provided a copy is also delivered via hand or overnight delivery or certified mail. If notice is received on a Saturday, Sunday, or legal holiday, it shall be deemed received on the next business day. 16.8 Waivers. No waiver by Landlord of a Default by Tenant shall be deemed a waiver of any other town, covenant, or condition hereof, or of any subsequent Default by Tenant of the same or any other term, covenant, or condition hereof. including, without limitation, attorneys fees incurred or suffered by Landlord by reason of Tenants failure to surrender the Premises on the expiration or earlier termination of this Lease in accordance with the provisions of this Lease. 16.10 Cumulative Remedies. No remedy or election hereunder shall be deemed exclusive but shall, wherever possible, be cumulative with all other remedies in law or in equity. 16.11 Binding Effect: Choice of Law. This Lease shall be binding upon the Parties, their personal representatives, successors, and assigns, and be governed by the laws of the State in which the Premises are located. Any litigation between the Parties hereto concerning this Lease shall be initiated in the county in which the Premises are located. 16.12 Landlord. The covenants and obligations contained in this Lease on the part of Landlord are binding on Landlord, its successors, and assigns only during their respective period of ownership of an interest in the Building. In the event of any transfer or transfers of such title to the Building, Landlord (and, in the case of any subsequent transfers or conveyances, the then grantor) shall be concurrently freed and relieved from and after the date of such transfer or conveyance, without any further instrument or agreement, of all liability with respect to the performance of any covenants or obligations on the part of Landlord contained in this Lease thereafter to be performed. 16.13 Attorneys Fees and Other Costs. If any Party brings an action or proceeding to enforce the terms hereof or declare rights hereunder, the Prevailing Party (as hereafter defined) in any such proceeding shall be entitled to reasonable attorneys fees. The term Prevailing Party shall include, without limitation, a Party who substantially obtains or defeats the relief sought. Landlord shall be entitled to attorneys fees, costs, and expenses incurred in the preparation and service of notices of Default and consultations in connection therewith, whether or not a legal action is subsequently commenced in connection with such Default or resulting breach. Tenant shall reimburse Landlord on demand for all reasonable legal, engineering, and other professional services expenses incurred by Landlord in connection with all requests by Tenant or any lender of Tenant for consent, waiver or approval of any kind. 16.14 Landlords Access; Showing Premises; Repairs. Landlord and Landlords agents shall have the right to enter the Premises at any time, in the case of an emergency, and otherwise at reasonable times upon reasonable notice for the purpose of showing the same to prospective purchasers, lenders, or tenants, and making such alterations, repairs, improvements, or additions to the Premises or to the Building, as Landlord may reasonably deem necessary. Landlord may at any time place on or about the Premises or Building any ordinary For Sale signs, and Landlord may at any time during the last 180 days of the term hereof place on or about the Premises any ordinary For Lease signs. All such activities of Landlord shall be without abatement of rent or liability to Tenant. 16.15 Signs. Tenant shall not place any signs at or upon the exterior of the Premises or the Building, except that Tenant may, with Landlords prior written consent, install (but not on the roof) such signs as are reasonably required to advertise Tenants own business so long as such signs are in a location designated by Landlord and comply with sign ordinances and the signage criteria established for the Industrial Center by Landlord. 16.16 Termination; Merger. Unless specifically stated otherwise in writing by Landlord, the voluntary or other surrender of this Lease by Tenant, the mutual termination or cancellation hereof, or a termination hereof by Landlord for Default by Tenant, shall automatically terminate any sublease or lesser estate in the Premises; provided, however, Landlord shall, in the event of any such surrender, termination, or cancellation, have the option to continue any one or all of any existing subtenancies. Landlords failure within 10 days following any such event to make a written election to the contrary by written notice to the holder of any such lesser interest shall constitute Landlords election to have such event constitute the termination of such interest. 16.17 Quiet Possession. Upon payment by Tenant of the Base Rent and Additional Rent for the Premises and the performance of all of the covenants, conditions, and provisions on Tenants part to be observed and performed under this Lease, Tenant shall have quiet possession of the Premises for the entire term hereof, subject to all of the provisions of this Lease. any and all advances made on the security thereof, and to all renewals, modifications, consolidations, replacements, and extensions thereof. Tenant agrees that any person holding any Mortgage shall have no duty, liability, or obligation to perform any of the obligations of Landlord under this Lease. In the event of Landlords default with respect to any such obligation, Tenant will give any Lender, whose name and address have previously been furnished in writing to Tenant, notice of a default by Landlord. Tenant may not exercise any remedies for default by Landlord unless and until Landlord and the Lender shall have received written notice of such default and a reasonable time (not less than 90 days) shall thereafter have elapsed without the default having been cured. If any Lender shall elect to have this Lease superior to the lien of its Mortgage and shall give written notice thereof to Tenant, this Lease shall be deemed prior to such Mortgage. The provisions of a Mortgage relating to the disposition of condemnation and insurance proceeds shall prevail over any contrary provisions contained in this Lease. (b) Attornment. Subject to the nondisturbance provisions of subparagraph (c) of this Paragraph 16.18, Tenant agrees to attorn to a Lender or any other party who acquires ownership of the Premises by reason of a foreclosure of a Mortgage. In the event of such foreclosure, such new owner shall not: (i) be liable for any act or omission of any prior landlord or with respect to events occurring prior to acquisition of ownership, (ii) be subject to any offsets or defenses which Tenant might have against any prior Landlord, or (iii) be liable for security deposits or be bound by prepayment of more than one months rent. (c) Non-Disturbance. With respect to a Mortgage entered into by Landlord after the execution of this Lease, Tenants subordination of this Lease shall be subject to receiving assurance (a nondisturbance agreement) from the Mortgage holder that Tenants possession and this Lease will not be disturbed so long as Tenant is not in default and attorns to the record owner of the Premises. (d) Self-Executing. The agreements contained in this Paragraph 16.18 shall be effective without the execution of any further documents; provided, however, that upon written request from Landlord or a Lender in connection with a sale, financing, or refinancing of Premises, Tenant and Landlord shall execute such further writings as may be reasonably required to separately document any such subordination or nonsubordination, attornment, and/or nondisturbance agreement, as is provided for herein. Landlord is hereby irrevocably vested with full power to subordinate this Lease to a Mortgage. 16.19 Rules and Regulations. Tenant agrees that it will abide by, and to cause its employees, suppliers, shippers, customers, tenants, contractors, and invitees to abide by, all reasonable rules and regulations (Rules and Regulations) which Landlord may make from time to time for the management, safety, care, and cleanliness of the Industrial Center, the parking and unloading of vehicles, and the preservation of good order, as well as for the convenience of other occupants or tenants of the Building and the Industrial Center and their invitees. Landlord shall not be responsible to Tenant for the noncompliance with said Rules and Regulations by other tenants of the Industrial Center. 16.20 Security Measures. Tenant acknowledges that the rental payable to Landlord hereunder does not include the cost of guard service or other security measures. Landlord has no obligations to provide same. Except for the gross negligence or intentional acts of Landlord and its agents, Tenant assumes all responsibility for the protection of the Premises, Tenant, its agents, and invitees and their property from the acts of third parties. 16.21 Reservations. Landlord reserves the right to grant such easements that Landlord deems necessary and to cause the recordation of parcel maps, so long as such easements and maps do not unreasonably interfere with the use of the Premises by Tenant. Tenant agrees to sign any documents reasonably requested by Landlord to effectuate any such easements or maps. 16.22 Conflict. Any conflict between the printed provisions of this Lease and the typewritten or handwritten provisions shall be controlled by the typewritten or handwritten provisions. 16.23 Offer. Preparation of this lease by either Landlord or Tenant or Landlords agent or Tenants agent and submission of same to Tenant or Landlord shall not be deemed an offer to lease. This Lease is not intended to be binding until executed and delivered by all Parties hereto. 16.24 Amendments. This Lease may be modified only in writing, signed by the parties in interest at the time of the modification. 16.25 Multiple Parties. Except as otherwise expressly provided herein, if more than one person or entity is named herein as Tenant, the obligations of such persons shall be the joint and several responsibility of all persons or entities named herein as such Tenant. 16.26 Authority. Each person signing on behalf of Landlord or Tenant warrants and represents that she or he is authorized to execute and deliver this Lease and to make it a binding obligation of Landlord or Tenant. The parties hereto have executed this Lease at the place and on the dates specified below their respective signatures. The following terms in the Lease are defined in the paragraphs opposite the terms. This Rent Adjustment Addendum is a part of the Lease dated September 251, 2000, by and between AMB PROPERTY, L.P. (Landlord) and Capstone Turbine Corporation (Tenant) for the premises commonly known as 16664 Stagg Street, Van Nuys, California. Monthly Base Rent for the each of the periods designated in this Addendum (Adjustment Periods) shall be the amount calculated in accordance with the alternative selected below (Rent Adjustment Alternative), but in no event shall the monthly Base Rent for an Adjustment Period be less than the highest monthly rent payable during the term preceding the Adjustment Period. $44,078.00 shall be the monthly Base Rent for Period One. $47,384.00 shall be the monthly Base Rent for Period Two. $50,938.00 shall be the monthly Base Rent for Period Three. $54;758.00 shall be the monthly Base Rent for Period Four. $58,865.00 shall be the monthly Base Rent for Period Five. 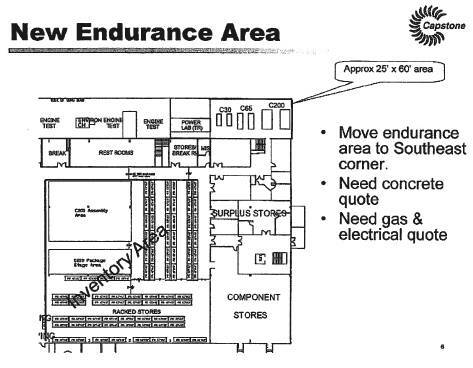 This Option to Extend is a part of the Lease dated September 25, 2000, by and between AMB PROPERTY, L.P. (Landlord) and Capstone Turbine Corporation (Tenant) for the premises commonly known as 16640 Stagg Street, Van Nuys, California. b. the Last Exercise Date is 4 months prior to the date that the Option Period would commence. 3. MONTHLY BASE RENT. The monthly Base Rent for each month of an Option Period shall be the amount calculated in accordance with the alternative selected below (Rent Adjustment Alternative), but in no event shall the monthly Base Rent for an Option Period be less than the highest monthly Base Rent payable during the term immediately preceding the Option Period. x Fixed rent adjustment (Fixed Rent Adjustment) 7.5% increase at the 1st and 31st month of each option period. a. In order to exercise an option to extend, Tenant must give written notice of such election to Landlord and Landlord must receive the same by the Last Exercise Date but not prior to the Earliest Exercise Date. If proper notification of the exercise of an option is not given and/or received, such option shall automatically expire. Options (if there are more than one) may only be exercised consecutively. Failure to exercise an option terminates that option and all subsequent options. Tenant acknowledges that because of the importance to Landlord of knowing no later than the Last Exercise Date whether or not Tenant will exercise the option, the failure of Tenant to notify Landlord by the Last Exercise Date will conclusively be presumed an election by Tenant not to exercise the option. b. Tenant shall have no right to exercise an option (i) if Tenant is in Default or (ii) in the event that Landlord has given to Tenant three or more notices of separate Defaults during the 12-month period immediately preceding the exercise of the option, whether or not the Defaults are cured. The period of time within which an option may be exercised shall not be extended or enlarged by reason of Tenants inability to exercise an option because of the provisions of this paragraph. c. All of the terms and conditions of this Lease, except where specifically modified by this Addendum, shall apply. d. The options are personal to the Tenant, cannot be assigned or exercised by anyone other than the Tenant, and only while the Tenant is in full possession of the Premises and without the intention of thereafter assigning or subletting. This Addendum to Industrial Lease (Addendum) is made and entered into as of the 25th day of September, 2000, by and between AMB Property, L.P., a Delaware limited partnership (Landlord), and Capstone Turbine Corporation, a Delaware corporation (Tenant), with reference to that certain Industrial Lease dated as of September 25th, 2000, by and between Landlord and Tenant (Lease). The promises, covenants, agreements and declarations made and set forth herein are intended to and shall have the same force and effect as if set forth at length in the body of the Lease. To the extent that the provisions of this Addendum are inconsistent with the terms and conditions of the Lease, the terms of this Addendum shall prevail and control for all purposes. Unless otherwise defined below, all terms used in this Addendum and defined in the Lease shall have the same meaning as is ascribed to such terms in the Lease. 1. Delivery of Premises. Subject to Landlord performing the improvements set forth on Attachment 2 and delivering the Premises pursuant to Section 2.6 of the Lease, Tenant acknowledges that it has inspected and accepts the Premises in their present as-is condition as suitable for the purpose for which the Premises are leased. The taking of possession by Tenant shall be conclusive to establish that the Premises are in good and satisfactory condition when possession is taken, except as expressly set forth in this Lease. Tenant further acknowledges that no representations or promises were made by Landlord or any agent of Landlord to repair, alter, remodel or improve the Premises, except as expressly set forth in this Lease. 2. Signage. Provided Tenant is not in default hereunder, Tenant shall have the right to install (i) a monument sign, and (ii) exterior sign identification of the Premises, at Tenants sole cost and expense (collectively, Tenants Signage). Tenants Signage shall be subject to Landlords approval as to size, design, location, graphics, materials, colors and similar specifications and shall be consistent with the exterior design, materials and appearance of the Industrial Center and the Industrial Centers signage program and shall be further subject to and comply with all applicable local governmental laws, rules, regulations, codes and other approvals. Landlord has the right, but not the obligation, to oversee the installation of Tenants Signage. The cost to operate, if any, Tenants Signage shall be paid for by Tenant, and Tenant shall be separately metered for such expense (the cost of separately metering any utility usage shall also be paid for by Tenant). Upon the expiration of the Lease Term, or other earlier termination of this Lease, Tenant shall be responsible for any and all costs associated with the removal of Tenants Signage, including, but not limited to, the cost to repair and restore the Premises to its original condition, normal wear and tear excepted. 3. Rental Abatement. Landlord shall grant to Tenant base rental abatement for the first 2 months of the Lease Term. 4. DWP Interconnect. Landlord shall allow Tenant the right to interconnect with the DWP grid, subject to DWP final approval. There shall be no cost or expense to Landlord. 5. Environmental Indemnification. Landlord shall indemnify, protect, defend, and hold Tenant, Tenants affiliates, and the officers, directors, shareholders, partners, employees, managers, independent contractors, attorneys, and agents of the foregoing (Tenant Entities) and the Premises, harmless from and against any and all damages, liabilities, judgments, costs, claims, liens, expenses, penalties, loss of permits, and attorneys and consultants fees arising out of or involving any Hazardous Substance that exists at or beneath the Premises or that migrate to, beneath or from the Premises, unless directly caused by Tenant or its agents. Landlords obligations under this Paragraph 4 shall include, but not be limited to, the effects of any contamination or injury to persons, property, or the environment and the cost of investigation (including consultants and attorneys fees and testing), removal, remediation, restoration and/or abatement thereof, or of any contamination therein involved. Landlords obligations under this Paragraph 4 shall survive the Expiration Date or earlier termination of this Lease directly caused by Tenant. 6. Early Possession. Tenant shall be given early possession of the premises (subject to all terms and conditions of the Lease with the exception of Rent) upon full execution of Lease documents. that Tenant shall bear the entire cost of any roof repair attributable to a negligent or intentional act or omission of Tenants Entities. 8. Tenant Improvements. Tenant shall have the right to construct canopies over the east parking lot/yard portion of the Premises, subject to Landlords reasonable approval. Such canopies shall be removed at the end of the Lease Term. 9. Subordination - Non-Disturbance from Existing Lender. Prior to the Commencement Date, Landlord shall provide Tenant with a commercially reasonable subordination and non-disturbance agreement from any existing lender to whose interest, Tenants interest in this Lease is subordinate. IN WITNESS WHEREOF, the parties hereto have executed this Addendum as of the date first written above. Carpet (in a mutually agreeable color/grade) the entire office space. Once the cul-de-sac is completed, Landlord shall install a wrought iron fence with gate similar to the existing entrance to the property (or a mutually acceptable substitute). Repair, clean, and seal the warehouse floor. Assist in the installation of a 4 high pressure gas line; any repair work necessitated by the installation shall be Landlords sole cost and expense. Install traffic rated drain across the northeastern ground level door. Landlord warrants that the parking lot shall drain properly with no unreasonable puddling. Term shall not commence until Landlords work as described in Item 3 above, as well connection to permanent electrical power is completed. This Tenant Improvement Addendum is a part of the Lease dated September 25, 2000, by and between AMB PROPERTY, L.P. (Landlord) and Capstone Turbine Corporation, a Delaware corporation (Tenant) for the premises commonly known as 16640 Stagg Street, Van Nuys, California. Tenant may construct at its sole cost and expense the improvements (Alterations) described on Exhibit 1 attached hereto. Prior to commencement of construction, Tenant shall obtain and deliver to Landlord any building permit required by applicable law and a copy of the executed construction contract(s). Tenant shall reimburse Landlord within 10 days after the rendition of a bill for all of Landlords actual out-of-pocket costs incurred in connection with the Alterations, including, without limitation, all management, engineering, outside consulting, and construction fees incurred by or on behalf of Landlord for the review and approval of Tenants plans and specifications and for the monitoring of construction of the Alterations. Tenant shall require its contractor to maintain insurance in the amounts and in the forms described in Exhibit 2. The Alterations shall be constructed by licensed contractors approved by Landlord and in accordance with rules, such as hours of construction, imposed by Landlord. 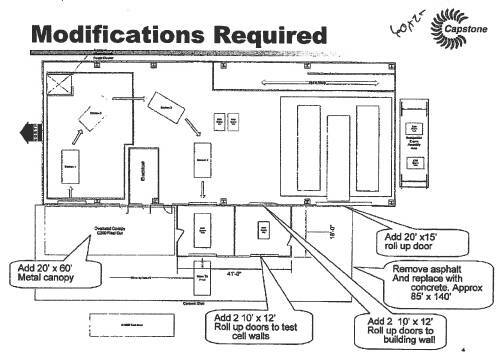 The Alterations shall be completed lien free, in accordance with the plans and specifications described in Exhibit 1, in a good, workmanlike, and prompt manner, with new materials of first-class quality and comply with all applicable local, state, and federal regulations. The competed Alterations shall be the property of Landlord and shall, subject to the provisions of the next sentence, be surrendered with the Premises upon the expiration or sooner termination of this Lease. Prior to commencing construction of the Improvements, Tenant shall obtain from its contractors and deliver to Landlord a commercially reasonable waiver and release of any and all claims against Landlord and liens against the Premises to which such contractor might at any time be entitled and to provide such payment and performance bonds as Landlord may require. The delivery of the waiver and release of claims and liens and such bonds shall be a condition precedent to Tenants ability to begin its construction work at the Premises. Tenant shall pay when due all claims for labor or materials furnished or alleged to have been furnished to or for Tenant at or for use on the Premises. Tenant shall give Landlord not less than 10 days notice prior to the commencement of any work in, on, or about the Premises, and Landlord shall have the right to post notices of non-responsibility in or on the Premises as provided by law. Tenant agrees to indemnify, protect, and defend Landlord and hold Landlord harmless against any loss, liability, or damage resulting from construction of the Alterations. Tenant hereby accepts the Premises as being in the condition required under the Lease. The Commencement Date of the Lease is October 1, 2000. The Expiration Date of the Lease is September 30, 2005. Instructions: The following questionnaire is to be completed by the Tenant Representative with knowledge of the planned/existing operations for the specified building/location. A copy of the completed form must be attached to all new leases and renewals, and forwarded to the Owners Risk Management Department. 1-1. Describe planned use (new Lease) or existing operations (lease renewal), and include brief description of manufacturing processes employed. THE MANUFACTURING PROCESSES INCLUDE: METAL FORMING, WELDING, MECHANICAL ASSEMBLY AND PRODUCT PERFORMANCE TESTING. Are hazardous materials used or stored? If so, continue with the next question. If not, go to Section 3.0. Are any of the following materials handled on the property? (A material is handled if it is used, generated, processed, produced, packaged, treated, stored, emitted, discharged, or disposed.) If so, complete this section. If this section is not applicable, skip this section and go on to Section 5.0. For the following groups of chemicals, please check the type(s), use(s), and quantity of each chemical used or stored on the site. Attach either a chemical inventory or list the chemicals in each category. Describe the storage area location(s) for these materials. Are hazardous wastes generated? If so, continue with the next question. If not, skip this section and go to section 4.0. Are any of the following wastes generated, handled, or disposed of (where applicable) on the property? Identify and describe those wastes generated, handled or disposed of (disposition). Specify any wastes known to be regulated under the Resource Conservation and Recovery Act (RCRA) as listed characteristic or statutory wastes. Include total amounts generated monthly. Please include name, location, and permit number (e.g. EPA ID No.) for transporter and disposal facility, if applicable. Attach separate pages as necessary. AIR EMISSION FROM WELDING AND PRODUCT TESTING. List and quantify the materials identified in Question 3-2 of this section. Are pollution controls or monitoring employed in the process to prevent or minimize the release of wastes into the environment? If so, please describe. Are underground storage tanks (USTs), aboveground storage tanks (ASTs), or associated pipelines present on site (lease renewals) or required for planned operations (new tenants)? If not, continue with section 5.0. If yes, please describe capacity, contents, age, design and construction of USTs or ASTs. Is the UST/AST registered and permitted with the appropriate regulatory agencies? Please provide a copy of the required permits. Indicate if any of the following leak prevention measures have been provided for the USTs/ASTs and their associated piping. Additionally, please indicate the number of tanks that are provided with the indicated measure. Please provide copies of written test results and monitoring documentation. If this Questionnaire is being completed for a lease renewal, and if any of the USTs/ASTs have leaked, please state the substance released, the media(s) impacted (e.g., soil, water, asphalt, etc. ), the actions taken, and all remedial responses to the incident. For Lease renewals, are there any above or below ground pipelines on site used to transfer chemicals or wastes? For new tenants, are installations of this type required for the planned operations? If so, please describe. If present or planned, have the chemical transfer pipelines been inspected or tested for leaks? If so, please indicate the results and provide a copy of the inspection or test results. Not present - not planned. Please be advised that this property participates in an Asbestos Operations and Maintenance Program, and that an asbestos survey may have been performed at the Property. If provided, please review the information that identifies the locations of known asbestos containing material or presumed asbestos containing material. All personnel and appropriate subcontractors should be notified of the presence of these materials, and informed not to disturb these materials. Any activity that involves the disturbance or removal of these materials must be done by an appropriately trained individual/contractor. For lease Renewals, are there any past, current, or pending regulatory actions by federal, state, or local environmental agencies alleging noncompliance with regulations? If so, please describe. For lease renewals, are there any past, current, or pending lawsuits or administrative proceedings for alleged environmental damages involving the property, you, or any owner or tenant of the property? If so, please describe. Yes - previous tenants/current owner have remediation in process for trichloroethylene. Should be complete in 4 months. Does the operation have or require a National Pollutant Discharge Elimination System (NPDES) or equivalent permit? If so, please provide a copy of this permit. For Lease renewals, have there been any complaints from the surrounding community regarding facility operations? If so, please describe. Have there been any worker complaints or regulatory investigations regarding hazardous material exposure at the facility? If so, please describe status and any corrective actions taken. 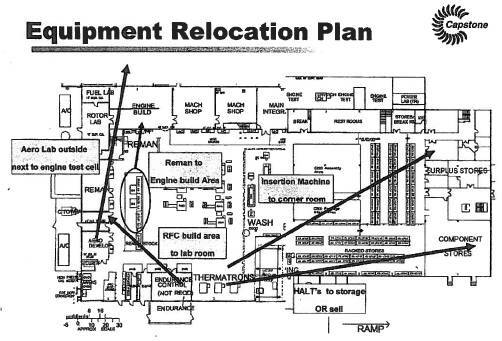 Has a Hazardous Materials Business Plan been developed for the site? If so, please provide a copy. I am familiar with the real property described in this questionnaire. By signing below, I represent and warrant that the answers to the above questions are complete and accurate to the best of my knowledge. I also understand that the Owner will rely on the completeness and accuracy of my answers in assessing any environmental liability risks associated with the property. This First Amendment to Lease (Amendment) is made and entered into as of October 7, 2008, by and between AMB Property, L.P., a Delaware limited partnership (Landlord) and Capstone Turbine Corporation, a Delaware corporation (Tenant). A. Tenant and Landlord are parties to that certain Industrial Lease dated September 25, 2000 (Lease). Pursuant to the terms and conditions of the Lease, Tenant has leased from Landlord the premises commonly known as 16640 Stagg Street, Van Nuys, CA 91406 consisting of approximately 78,711 rentable square feet (Premises). B. Tenant has requested and Landlord intends to give its consent to the making of certain alterations to the Premises as set forth in Exhibit A to this Amendment (Alterations) on the terms set forth in this Amendment. C. Landlord and Tenant also intend to provide for the removal of the Alterations and Other Alterations (as hereafter defined) on the terms set forth in this Amendment. D. All capitalized terms used herein but not specifically defined in this Amendment shall have the meanings ascribed to such terms in the Lease. The term Lease where used in the Lease shall hereinafter refer to the Lease, as amended by this Amendment. 1. Consent to Alterations. Landlord hereby consents to the making of the Alterations by Tenant provided the Alterations are constructed in a good and workman-like manner and lien free condition and in compliance with all applicable laws, statutes, ordinances, regulations, rules, covenants and agreements governing the Premises (collectively Applicable Law). 2. Removal of Alterations. Notwithstanding anything to the contrary, at the end of the Term or earlier termination of the Lease, at Tenants sole cost and expense, Tenant shall, in compliance with Applicable Law, remove the Alterations and promptly repair any damage to the Premises or any areas serving the Premises caused by the removal of the Alterations. 3. Removal of Other Alterations. Landlord and Tenant acknowledge and agree that during the Term Tenant has made or constructed other alterations to the Premises which are attached to the outside of the Building or outside of the Building and not within the four concrete tilt-up walls of the Building and alterations to the inside of the Building including, but not limited to the construction or installation of warehouse offices, conduits, cabling, pipes, and data lines (collectively Other Alterations) for which Landlords consent was not sought or obtained. Notwithstanding anything to the contrary, at the end of the Term or earlier termination of the Lease, at Tenants sole cost and expense, Tenant shall, in compliance with Applicable Law, remove the Other Alterations and promptly repair any damage to the Premises or any areas serving the Premises caused by the removal of the Other Alterations. Notwithstanding anything to the contrary, nothing in this Amendment shall be deemed to be consent by Landlord to the Other Alterations. 4. Indemnity by Tenant. Notwithstanding anything to the contrary, the indemnity set forth in Paragraph 8.5 of the Lease by Tenant to Landlord and Landlord Entities (as defined in the Lease) shall be specifically applicable to the construction and removal of the Alterations and Other Alterations as well as the compliance of the Alterations and Other Alterations with Applicable Law. 5. Brokers Fees. Tenant represents and warrants that it has dealt with no broker, agent or other person in connection with this Amendment and that no broker, agent or other person brought about this transaction and Tenant shall indemnify, defend, protect and hold Landlord harmless from and against any claims, losses, liabilities, demands, costs, expenses or causes of action by any broker, agent or other person claiming a commission or other form of compensation by virtue of having dealt with Tenant with regard to this Amendment. 6. Effect of Amendment. Except as modified herein, the terms and conditions of the Lease shall remain unmodified and continue in full force and effect. In the event of any conflict between the terms and conditions of the Lease and this Amendment, the terms and conditions of this Amendment shall prevail. Except as otherwise provided herein, the terms and provisions of the Lease are hereby incorporated in this Amendment. 7. Authority. Subject to the provisions of the Lease, this Amendment shall be binding upon and inure to the benefit of the parties hereto, their respective heirs, legal representatives, successors and assigns. Each party hereto and the persons signing below warrant that the person signing below on such partys behalf is authorized to do so and to bind such party to the terms of this Amendment. 8. Counterparts. This Amendment may be executed in counterparts by the parties, which counterparts, each of which shall be an original, but all of which shall constitute one and the same instrument. 9. Estoppel. Tenant warrants, represents and certifies to Landlord that as of the date of this Amendment, (a) Landlord is not in default under the Lease, as amended by this Amendment, and (b) Tenant does not have any defenses or offsets to payment of rent and performance of its obligations under the Lease, as amended by this Amendment, as and when the same become due. IN WITNESS WHEREOF, the parties hereto have signed this Amendment as of the date first written above. EXCEPT therefrom those portions dedicated for street purposes per Instrument Number 78-1094459 and 02-1242807 (known as Stagg Street). 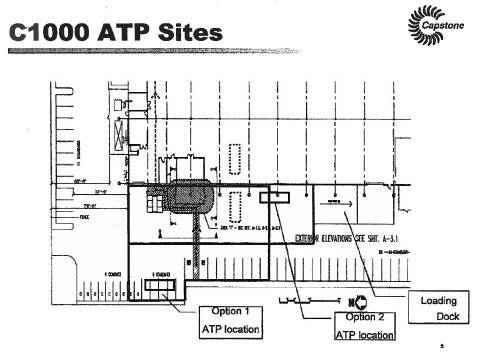 NOTE: The 60 foot wide yards to be maintained for an oversized building for the above described parcel of land are depicted in EXHIBIT B attached hereto. This Second Amendment to Lease (Amendment) is made and entered into as of August 11, 2009, by and between AMB Property, L.P., a Delaware limited partnership (Landlord) and Capstone Turbine Corporation, a Delaware corporation (Tenant). A. Tenant and Landlord are parties to that certain Industrial Lease Agreement dated September 25, 2000 as amended by a First Amendment to Lease dated October 7, 2008 (collectively Lease). Pursuant to the terms and conditions of the Lease, Tenant has leased from Landlord the premises commonly known as 16640 Stagg Street, Van Nuys, CA 91406 consisting of approximately 78,711 rentable square feet (Premises). B. Landlord and Tenant desire to extend the Term of the Lease and modify certain other obligations of Tenant under the Lease on the terms set forth in this Amendment. C. All capitalized terms used herein but not specifically defined in this Amendment shall have the meanings ascribed to such terms in the Lease. The term Lease where used in the Lease shall hereinafter refer to the Lease, as amended by this Amendment. 1. Exercise of Option and Extension of Term. The Term of the Lease is hereby extended (Extended Term) until and including December 31, 2012 (First Option Termination Date). Notwithstanding anything to the contrary contained in the Lease, the extension of the Term for the Extended Term, even though for a shorter period of time than set forth in the Option for Period One, as defined in the Option to Extend Addendum to the Lease (Option Addendum), shall be deemed an exercise by Tenant of the entire Option for Period One. 3. Remaining Options. Landlord and Tenant acknowledge and agree that, pursuant to the Option Addendum, Tenant has one additional and remaining 5-year option (Remaining Option) to extend the Term of the Lease beyond the First Option Termination Date, pursuant to the terms of the Option Addendum. Notwithstanding the foregoing or anything to the contrary contained in the Option Addendum, if Tenant exercises the Remaining Option, the Monthly Base Rent from the commencement of the Remaining Option through the end of the thirtieth (30th) month thereafter shall be $66,904.35 and shall thereafter increase to $71,922.18 at the beginning of the thirty-first (31st) month through the end of the Remaining Option. 4. As-Is. Tenant acknowledges and agrees that its tenancy of the Premises through the First Option Termination Date is a continuation of its tenancy of the Premises under the Lease. Therefore, Tenant accepts the Premises in its existing condition, as-is, where is, and with all faults. 5. Landlords Address for Payments and Notices. 6. Brokers Fees. Tenant represents and warrants that it has dealt with no broker, agent or other person in connection with this transaction and that no broker, agent or other person brought about this transaction and Tenant shall indemnify, defend, protect and hold Landlord harmless from and against any claims, losses, liabilities, demands, costs, expenses or causes of action by any broker, agent or other person claiming a commission or other form of compensation by virtue of having dealt with Tenant with regard to this leasing transaction. 7. Effect of Amendment. Except as modified herein, the terms and conditions of the Lease shall remain unmodified and continue in full force and effect. In the event of any conflict between the terms and conditions of the Lease and this Amendment, the terms and conditions of this Amendment shall prevail. Except as otherwise provided herein, the terms and provisions of the Lease are hereby incorporated in this Amendment. 8. Authority. Subject to the provisions of the Lease, this Amendment shall be binding upon and inure to the benefit of the parties hereto, their respective heirs, legal representatives, successors and assigns. Each party hereto and the persons signing below warrant that the person signing below on such partys behalf is authorized to do so and to bind such party to the terms of this Amendment. 9. Counterparts. This Amendment may be executed in counterparts by the parties, which counterparts, each of which shall be an original, but all of which shall constitute one and the same instrument. 10. Estoppel. Tenant warrants, represents and certifies to Landlord that as of the date of this Amendment, (a) Landlord is not in default under the Lease, as amended by this Amendment, and (b) Tenant does not have any defenses or offsets to payment of rent and performance of its obligations under the Lease, as amended by this Amendment, as and when the same become due. THIS THIRD AMENDMENT TO LEASE AGREEMENT (the Third Amendment) is entered into as of the 28 day of March, 2013, by and between Prologis, L.P., a Delaware limited partnership (Landlord), formerly known as AMB Property, L.P. a Delaware limited partnership and Capstone Turbine Corporation, a Delaware corporation (Tenant). WHEREAS, Landlord and Tenant have entered into a Lease dated September 25, 2000 as amended by First Amendment to Lease dated October 7, 2008 and Second Amendment to Lease dated August 11, 2009 (collectively Lease), pursuant to which Landlord leased to Tenant certain premises consisting of approximately 78,711 square feet located at 16640 Stagg Street, Van Nuys, California 91406 (the Premises). 2. Except as otherwise expressly provided herein, all defined terms used in this Third Amendment shall have the same respective meanings as are provided for such defined terms in the Lease. Tenant shall accept the Premises in its as is condition and shall pay Operating Expenses as provided in the Lease during the Second Extension Term. 3. Tenant represents and warrants that it has dealt with no broker, agent or other person in connection with this transaction and that no broker, agent or other person brought about this transaction, and Tenant agrees to indemnify and hold Landlord harmless from and against any claims by any other broker, agent or other person claiming a commission or other form of compensation by virtue of having dealt with Tenant with regard to this leasing transaction. 4. Insofar as the specific terms and provisions of this Third Amendment purport to amend or modify or are in conflict with the specific terms, provisions and exhibits of the Lease, the terms and provisions of this Third Amendment shall govern and control; in all other respects, the terms, provisions and exhibits of the Lease shall remain unmodified and in full force and effect. 5. Landlord and Tenant hereby agree that (i) this Third Amendment is incorporated into and made a part of the Lease, (ii) any and all references to the Lease hereinafter shall include this Third Amendment, and (iii) the Lease and all terms, conditions and provisions of the Lease are in full force and effect as of the date hereof, except as expressly modified and amended hereinabove. 6. Any obligation or liability whatsoever of Prologis, a Maryland real estate investment trust, which may arise at any time under this Lease or any obligation or liability which may be incurred by it pursuant to any other instrument, transaction, or undertaking contemplated hereby shall not be personally binding upon, nor shall resort for the enforcement thereof be had to the property of, its trustees, directors, shareholders, officers, employees or agents, regardless of whether such obligation or liability is in the nature of contract, tort, or otherwise. IN WITNESS WHEREOF, the parties hereto have signed this Third Amendment as of the day and year first above written.